This the time of year that we spend the most time using the crock pot. Soups, stews, chili and roasts go on to the menu rotation more than in the warmer weather. We take a break from light salads, rice and veggie stir frys and grilled chicken to add in heartier cold weather foods. Yummy and so soul warming. 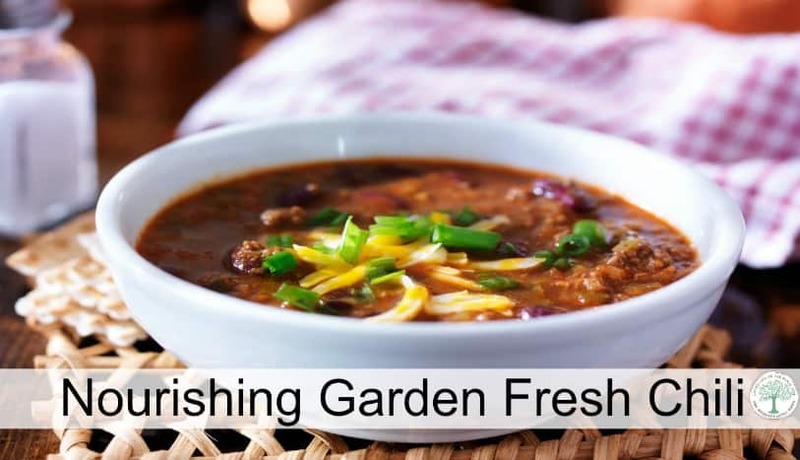 Nourishing garden fresh chili is always on our fall menu rotation. I totally love easy homemade chili, especially in the cooler fall weather. This award winning chili recipe will be like a hug for your tummy. This nourishing garden fresh chili is simply basic chili recipe that uses up the last bits of what was still growing in the garden. It’s also easily made from preserved ingredients if you have them.To make this even healthier, simply sprout your beans a day or two before you want to make it. As with all ground beef chili recipes, you CAN use ground turkey or chicken if you would like instead. To make it more special, you can replace the ground meat with shredded beef roast pieces. Simply use leftover beef roast and shred, then use that to replace the ground beef. Don’t forget to add some cornbread on the side to make this meal complete! Nourishing bone broth, garden fresh tomatoes, onions and jalapenos make this fall weather treat a delight! Begin by sauteeing the onions and garlic in 1 tsp butter. Add the ground beef and cook through. Place meat mixture in a crockpot set on low. Core and quarter the tomatoes and add to the crock. Add the beans, jalapeno, seasonings and cover with the broth. Cook on low for 6-8 hours or 3-4 hours on high. Serve with shredded cheddar cheese, sour cream, and chives. Looks and sounds delicious. I love chili.